The Global Volcanism Program has no activity reports for Calabozos. The Global Volcanism Program has no Weekly Reports available for Calabozos. The Global Volcanism Program has no Bulletin Reports available for Calabozos. The composite late-Pleistocene Calabozos caldera (14 x 26 km) produced major rhyodacitic-to-dacitic ashflow sheets of ~200-500 km3 magma each, collectively referred to as the Loma Seca Tuff, at 0.8, 0.3, and 0.15 million years ago. Eruptive activity has continued into the Holocene, forming the 20-25 km3 dacitic-to-andesitic Cerro del Medio complex at the southern end of the caldera and the four clustered vents of Descabezado Chico near the western caldera rim. The late-Holocene 2.5 km3 Escorias dacitic lava flow from Descabezado Chico traveled more than 30 km S. Several hot-spring clusters are present along the margin of the central resurgent uplift within the caldera. Drake R E, 1976. Chronology of Cenozoic igneous and tectonic events in the central Chilean Andes-latitudes 35.5 to 36° S. J. Volcanol. Geotherm. Res., 1: 265-284. Grunder A L, Mahood G A, 1988. 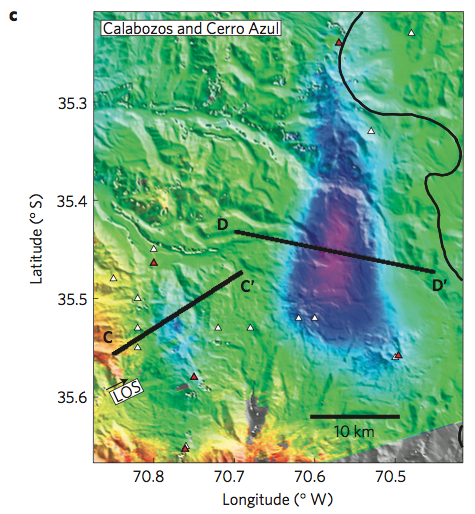 Physical and chemical models of zoned silicic magmas: the Loma Seca Tuff and Calabozos caldera, southern Andes. J Petr, 29: 831-867. Hildreth W, Grunder A L, Drake R E, 1984. 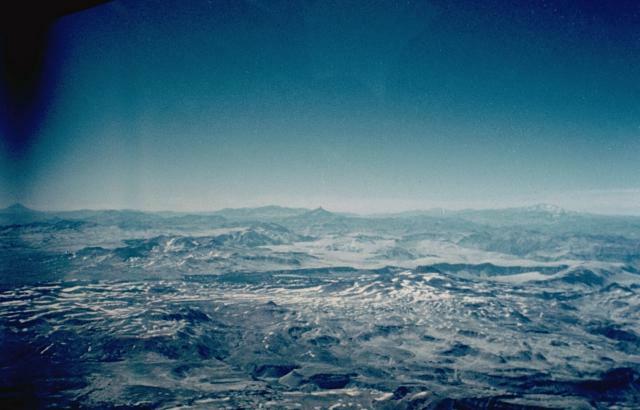 The Loma Seca tuff and the Calabozos caldera: a major ash-flow and caldera complex in the southern Andes of Chile. Geol Soc Amer Bull, 95: 45-54. The Global Volcanism Program is not aware of any Holocene eruptions from Calabozos. If this volcano has had large eruptions (VEI >= 4) prior to 10,000 years ago, information might be found on the Calabozos page in the LaMEVE (Large Magnitude Explosive Volcanic Eruptions) database, a part of the Volcano Global Risk Identification and Analysis Project (VOGRIPA). Volcanic ground subsidence observed in interferogram stacks spanning the earthquake (with earthquake effects removed). We assume the ground displacement is of short duration compared to the interferogram time span, so we compute the stack by summing the interferograms and dividing by the number of measurements in the stack for each pixel. From: Pritchard et al. 2013. Reference List: Pritchard et al. 2013. There is no Emissions History data available for Calabozos. The 26 x 14 km late-Pleistocene Calabozos caldera contains several post-caldera vents of Holocene age. The Descabezado Chico group (mid right-center) was constructed over the buried western rim of the caldera. The Cerro de Medio group (mid extreme-right) grew within the southern part of the caldera. No historical eruptions are known, but hot-spring clusters occur within the caldera. There are no samples for Calabozos in the Smithsonian's NMNH Department of Mineral Sciences Rock and Ore collection. Large Eruptions of Calabozos Information about large Quaternary eruptions (VEI >= 4) is cataloged in the Large Magnitude Explosive Volcanic Eruptions (LaMEVE) database of the Volcano Global Risk Identification and Analysis Project (VOGRIPA).